The problem arises when these teams get tunnel vision, focusing on what their metrics are without understanding and contributing to the whole vision of the marketing department. Silos develop, creating a domino effect of increasing complexity. In my role at Adobe, one of my major initiatives focuses on breaking down these silos. 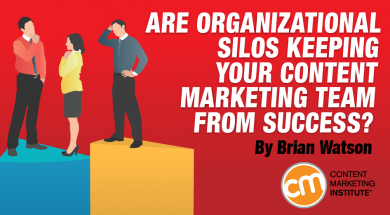 How do we knock down silos to simplify content marketing? 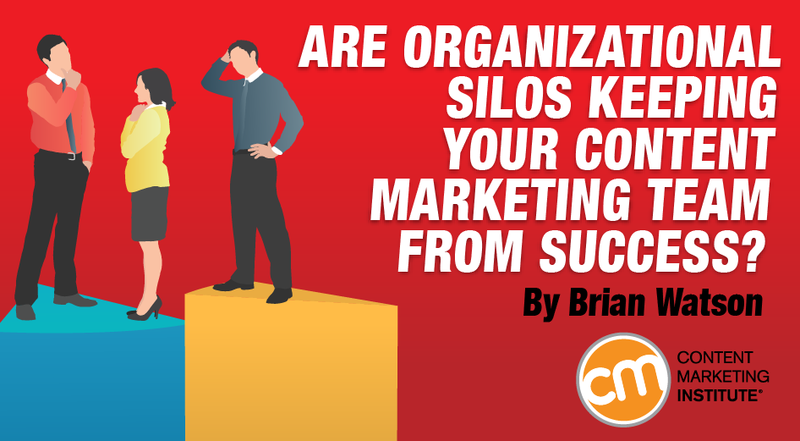 The key to begin crumbling silos within your company is to get your whole team on the same page with a clear definition of the overall company marketing goal. This way, you can determine what the priorities should be within the company and put other initiatives on the back burner if need be. To understand this, we can turn to mathematics. My son has been working hard to learn how to add fractions. The other night, he asked me to help him with a problem and I had an epiphany. Admittedly, it’s been a while since I learned this stuff in my elementary school math course. When I looked at the problem for the first time, it seemed impossible (just like it did years ago). The three numbers were so unlike each other. How could they possibly end up being one number? Of course, I had to consult with Google and conjure up my vague memories of school math lessons. And, I discovered one concept that, while useful in helping my son, was much more useful for solving the silo problems that plague many cross-functional relationships. What do fractions have to do with content marketing? Well, I’ve realized that, in dealing with Adobe marketing functions, we talk to each other about metrics that are important to our sub-teams, but we don’t understand the common ground, making it difficult for us to work together as the marketing team. While looking at this problem, I realized that we couldn’t just add the three numbers without a common denominator. In other words, we needed to create a common metric to get us all working and thinking together. Only in this way can we break down silos among the teams. I went on a quest to determine our common denominator and how our parts contribute to it. With such different goals, how can these teams work together as one? Instead of individual team goals we must align with a much deeper vision or metric. Only in this way, with one common vision, can your company break down the silos that hinder content marketing success. It’s all about finding common ground from which to work. Like converting to a new denominator so all the numbers can be added together, aligning your individual team metrics with your overall marketing goal often means creating a new metric to which all teams can align. At Adobe, one of our unifying metrics is “quality content.” Even if the social team’s goal is increased engagement, PR’s is getting journal mentions, and SEO’s is gaining high rankings on Google, when we come together and strategize, it is with the purpose of increasing the output of quality content to our audience. By focusing on this common denominator, we can communicate marketing’s core objectives clearly. We also know that in producing higher-quality content, each team’s individual goals can be met: The social team will garner increased engagement, the PR team will generate more journal placements, and the SEO team will increase its traffic due to higher rankings. Tip: Create a common denominator by throwing out your metrics and focusing on the end result. To determine your company’s common denominator, it’s best to analyze if and how your team metrics contribute to the marketing department’s final goal. For example, if your goal is to increase positive brand awareness to contribute to the bottom line, what is the one thing you can do to reach that goal? Produce quality content. All of those other metrics should be parts of reaching that company goal. I have come to the conclusion that productivity is the act of bringing a company closer to its goal. Every action that brings a company closer to its goal is productive. Every action that does not bring a company closer to its goal is not productive. If your teams’ metrics aren’t bringing your company closer to its goal, it is definitely time to reassess your metrics. For Adobe, we realized that producing quality content was our overall company goal. With this in mind, a team discussion can happen when a company meeting is held. Instead of the PR sub-team coming to the meeting only to address its concerns about journal mentions, it comes with the understanding that the ultimate goal is to produce quality company content. That way, when the meeting focuses on producing quality content, PR won’t feel that its needs aren’t being addressed. After all, creating quality content is now PR’s overriding metric or goal, as it is for every other sub-team in the room. The other metrics are merely a means to an end. When all teams can work from a common ground, you will find that the silos that once divided your teams are broken. And, until they’re knocked down, you will feel the tension. For example, if the SEO sub-team still comes to marketing meetings to share the metrics of pushing too many keywords, it is still too focused on its individual denominators. After all, what is quality content? We all know that it’s not keyword-stuffed articles. On the contrary, as silos are broken, a company team spirit will develop. In the end, you’ve simplified the process because sub-teams no longer crash against each other at each meeting, but instead talk about the common denominator. My challenge to you: Take a look at your company marketing team and identify your sub-team’s denominators. This first step is important. After all, you can’t find a common denominator without knowing what your original denominators were. Then, develop a common denominator based on a combined definition of your sub-team’s goals. Does your team need to tackle a major content marketing initiative but lack the expertise to make it happen? CMI can help. Our Online Training & Certification Program provides you with must-know strategies, tactics, and best practices to build a strong foundation for your projects. Editor’s note: Adobe is a Content Marketing Institute benefactor, which is a paid supporter of our website and content creation activities.